With more spare parts than we can count, we are sure that A N A Tyres and Exhausts will match the right exhaust to your car. In addition to car exhausts we service vans and company vehicles. We provide an efficient vehicle and car repair service in good time and at competitive prices. 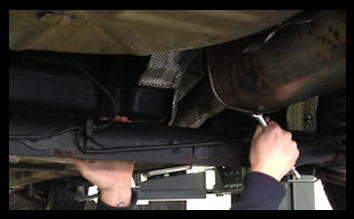 If your car fails its MOT due to emissions, our catalytic converters aim ensure that our customers leave with green feet. If you are on a budget you shall be glad to learn that we have a wide range of exhausts which can keep the costs down. Don't neglect our new exhausts, these can come with a one or two year guarantee or a lifetime guarantee depending on which system you choose. With top brands such as Bosal, Timax and Walkers our exhausts are fully aluminised which reduces corrosion to the part.